I’ve got my first game(s) of 8th Edition Warhammer 40k scheduled for tomorrow, and have been thinking a lot about list-building and the like in advance of this. I’m taking Necrons, and my opponent will be fielding Orks, so I have no idea what to expect there beyond a massive green tide. My Necrons list is primarily Immortals and Lychguard – the Immortals now fielded as groups of 10 to help with the Reanimation Protocols changes. It’s very basic, especially seeing as how Lychguard are such a points-sink now that taking even five of the buggers can mean you’ve got very little room for anything else! I’m also including three Wraiths, though I’m still weighing up whether I want to bring them or another squad of Immortals… Despite the new edition stuff, I still feel that Necrons are the faction I feel most at home with, and so I’m excited to see how they work and stuff! I’ve also been thinking about Dark Eldar, or Drukhari as they’re now known, and trying to come up with a decent list to finally get the kabal to the tabletop. I’ve played with Necrons before so, despite the rules changes, I think I’m still most comfortable with them. Trying to develop a Drukhari list, I initially thought about just adapting my current list that I’d been building towards since the new year, but which had been written for 7th Edition. I’ve come up with the following, anyway, and don’t really know how good it would be (especially with me at the helm!) but I really want to try these folks out soon! So this list is my first attempt at creating an army specifically for 8th. Dark Lances seem to be the thing here, with Strength 8 and AP -4, putting out D6 shots to boot, I suppose it’s clear to see why. The blaster is a shorter-range version of this, so I’ve kept them wherever they can go, as well. It’s a very shooty army, of course, which is kinda what I’d been expecting from the Drukhari when I first started looking into them. The basic idea is to have pretty much everything flying around the table shooting stuff up. The Wyches are the only unit not in a vehicle, simply because I can’t fit another one in, but I’m thinking I should be able to clear away enough threats to get them into close combat with the amount of shots I’ll be firing from everything else each turn. 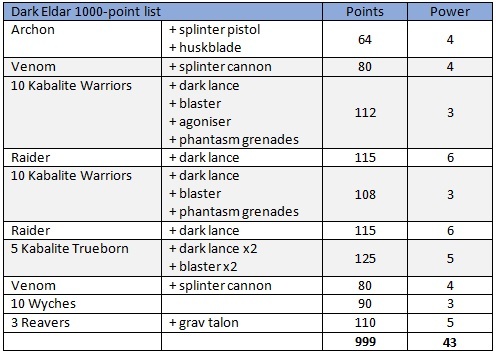 I’m considering shrinking the squad to five, and giving them a Venom, however; while it is cool to have the special weapons in my Kabalite squads, the splinter weapons are definitely easier to keep track of, as they always wound on a 4+, so there’s less “What’s your toughness, again?” questions to ask! But I definitely want to try out this list as it stands, before making any further amendments! So how does this fare with what I’ve got built and painted to date? I’ve got the Warriors and the Wyches done, and one squad of Trueborn isn’t far off – I’d painted them with haywire blasters, as that was the thing for 7th of course, but have got two built up with dark lances, so just need to get them finished. And then five more built and painted… The vehicles are always my major bugbear, however! I’ve got to pull my finger out on that front, and try to get them finished for the 1000-point Oath army that I’ve previously talked about, as well! I think there’s going to be a lot of work taking place over the next few days with these guys, anyway!! How’s everybody else faring with 8th so far? Hopefully you’ve been getting a lot of exciting games in! I keep hearing really positive things about all of the changes, anyway, so I’m really excited to get my miniatures onto the tabletop and into battle!